Hill’s provide precisely balanced nutrition to address your small breed mature dog's individual needs. 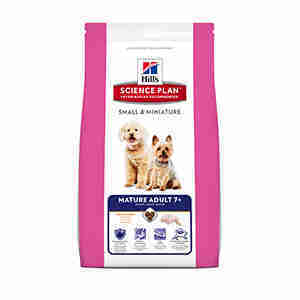 Science Plan™ Small & Miniature Mature Adult is formulated to support strong immune system, healthy vital organs and oral health. With clinically proven antioxidants, added vitamins and minerals. pomace, citrus pulp, grape pomace, spinach powder. (Selenium) 0.4mg, with natural antioxidant. Having spoken to my vet they suggested using a mature food for our chihauhau. I have to say she absolutely loves this food. It seems better and easier for her to digest. Really pleased I purchased it and will continue to use it.